Junk food is delicious. 9 times out of 10 if you ask me if I want junk food or something healthy I am going to go for the junk food. Because it is awesome. But with that deliciousness comes a lot of ingredients that are terrible for you. It is easy to ignore because seriously who wants to stop eating junk food all together? CRAZIES. It turns out that junk food doesn't haven't to be all bad. There are alternatives that allow you to indulge in moderation and not be taking in all those terrible ingredients. 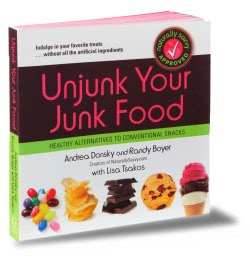 My copy of Unjunk Your Junk Food is a huge asset when looking for tasty alternatives to the traditional junk food. The book explains what ingredients are bad for you, which to steer clear from completely and which are okay in moderation. Then for each junk food they offer an alternative. For both the junk food and the alternative they point out what makes the product good/bad and all the nutritional information. Even if your favourite junk food is not covered in the book you will learn tips that you can apply to any other food. My friend Sam also got a copy of the book and she made an excellent point about the size of the book. It is small enough that you can put it into your purse and take it with you to the store so you have all the information you need right with you when you are shopping. Such an important tool to have when you are navigating the sometimes confusing organic aisle. So many choices, some that you have never heard of before, and they are not all created equally. 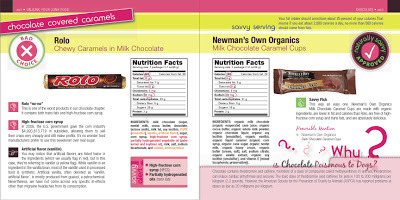 This book will help you navigate those aisles and pick the treat that works best for you. As part of our Eco-Challenge this month we are working to rid our food of GMO's. We will be using the book to help us make smarter choices when we crave junk food. Joe has agreed to try Nature's Path Organic Toaster Pastries in place of his Pop Tarts. I'm going to be looking for Sun Cups to replace by beloved Reece's Peanut Butter Cups. With chapters covering chips/dips, icecream/frozen treats, cookies, chocolate, cakes/dessert, granola bars/snacks, candy and drinks you are bound to found a load of healthier alternatives to what you are currently eating. I highly recommend picking up a copy of Unjunk Your Junk Food and starting down the path to healthier options for your cravings. I know it would be better to just not eat this stuff at all but been there, tried that and those peanut butter cups just keep me coming back! Have you found any alternatives to the traditional junk food products? I received Unjunk Your Junk Food for free but was not required to do a review. I opted to review it because I think it is awesome and it is helping us look for GMO free alternatives. All views expressed are my own. Justins dark peanut butter cups are the best. I highly recommend this company. All the info is there on how to buy it. It used to be available on Kindle, but can't see on Amazon if it still is. If Amazon ships to India then you would be able to get a hard copy of it!